This motivating four-day camp focuses on teaching soccer fundamentals, purpose, body balance, safety, directional movements, heading, goalie positioning, ball handling and sportsmanship. Our experienced instructors keep the ball rolling with this engaging camp. Pre-register at the Park Office from now until June 7 or until the camp is full. 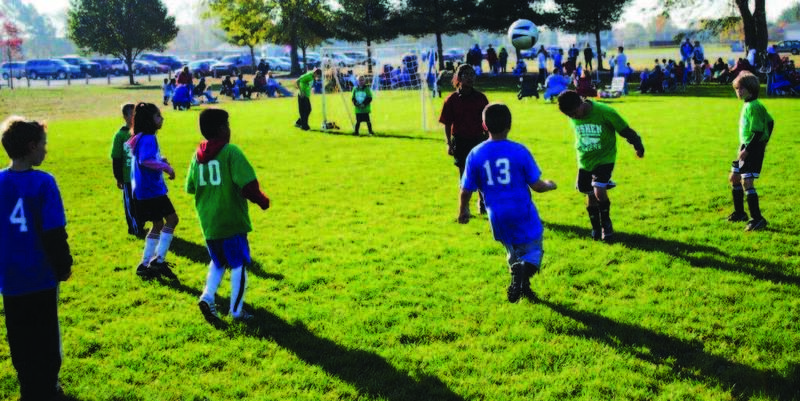 The Goshen Sharks soccer program is a co-ed recreational league open to kids ages 4–10. Our program is designed to encourage athletic activity and a love of the world’s most popular sport. The program places an emphasis on effort, participation and skill development. Volunteer coaches are needed for the program to be successful. For more information, please contact Tyler at 537-3843 or e-mail tylermclead@goshencity.com. *Age divisions may change based on enrollment totals. This camp will launch participants into the sport of basketball. Camp is designed to introduce those new to the sport and to further participants’ understanding by instructing on a variety of basketball rules while also implementing new skills. This two-day camp is very helpful in preparing for our youth basketball league set to begin on January 25, 2020. If registering for the youth basketball league, these camp dates are included in your league registration fee. All league participants must attend at least one of the camp dates. For more information, contact Tyler at 537-3843 or e-mail tylermclead@goshencity.com. This youth basketball program is a co-ed recreational league open to kids ages 6–10. Our program is designed to encourage athletic activity and a love of the great game of basketball. The program places an emphasis on effort, participation and skill development. Volunteer coaches are needed for the program to be successful. For more information, please contact Tyler at 537-3843 or e-mail tylermclead@goshencity.com.